The CORD automobile was introduced as a new marque by Erret Cord in 1929. It was the first American front wheel drive car to be put into quantity production and this feature would be retained by the company throughout it's eight years of production. Erret Lobban Cord was born in Warrensburg, Missouri in 1894. When little more than a teenager, he made and lost three fortunes, buying and selling secondhand Model 'T' Ford's and eventually became a salesman in a MOON dealership, selling their very popular 'Victory' model. But, like all good things, there came a time when sales dipped, resulting in the loss of Cord's high wages and commission. In 1924, the Auburn Motor Company was in the hands of the receiver and Cord was offered the chance to reorganise the company in the position of General Manager. Within a year, Cord owned Auburn outright and the company was again in an affluent state. An extension was added to the factory and by 1929, sufficient capitol had been amassed to be able to purchase other businesses such as the Stinson Aircraft company, Lycoming engines and the New York Shipbuilding Corporation. Another aquisition was Duesenberg, a small company that had many racing successes behind them, but due to poor management didn't have the funds to develop a new car. The fact that the company was for sale at a giveaway figure gave Cord the idea to produce a luxury car carrying the well known Duesenberg name that would be capable of competing with the best on offer from any other manufacturer in the world. The result was the infamous Duesenberg Model 'J'. At the same time, Cord decided to produce a car badged with his own name and the CORD L29 was offered through Auburn showrooms towards the end of 1929. The L29 was designed by Carl Van Ranst, who had worked on the front wheel drive racing cars of Harry Miller, that had beaten the competition in the Indianapolis 500 race for several years. So it was no real surprise that, like the Miller cars, the CORD L29 had a de Dion front axle and inboard drum brakes to keep down the unsprung weight. The intention was to position the L29 between the Auburn and Duesenberg ranges. It was powered by a 4.9 litre straight eight Lycoming engine, although the ratio's of the three speed gearbox and rear axle were totally inappropriate and gave a top speed of only 80 mph. Other features that were coolly received were the horizontal gear lever that protruded from the dashboard and the very low geared steering that required four turns of the steering wheel from lock to lock. There was also a major problem with the universal joints of the front wheel drive that were prone to failure. The full standard range of CORD L29's comprised a sedan, Brougham, Convertible, Cabriolet and Convertible Phaeton. Specialist coachbuilders such as Hayes, Murphy and in England, Freestone & Webb also built custom bodies on the L29 chassis. But the L29 was offered just two months before the 'Wall Street Crash' in 1930 and there were few buyers willing to purchase a new and expensive, unproven, luxury car at such an unstable time. Because of this, production of the CORD L29 ceased in 1932 after less that 4,500 had been built. It could have been a very desirable car, but unfortunately, it was introduced at the wrong time and wasn't sufficiently developed before it was put on offer. The CORD name didn't reappear until November 1935, when an entirely new design was introduced at the New York and Chicago Auto Show's. Designed by Gordon Buehrig, it was originally intended to be a 'small' Duesenberg. Called the CORD 810, it had unique advanced styling that was quickly given the doubtful name 'Coffin nose' due to it's lack of a conventional radiator grille which had been replaced by a long flat 'alligator' bonnet that sat over long louvres extending from door to door round the front. Retractable headlights operated by a hand-crank system were modified landing lights produced by the Stinson Aircraft company. The design had no running boards, concealed door hinges, a petrol filler hidden by a hinged cover and the twin rear lights were very streamlined. Dash lights were rheostat controlled and there were variable speed windscreen wipers. Power came from a 4.7 litre V8 Lycoming engine connected to a three speed, plus overdrive fourth, pre-selector, electrically controlled gearbox. To qualify as a production entrant to the shows, a minimum of 100 cars had to be produced and to acheive this, many ;quick-fix' solutions were used. Bankruptcy sales and 'job-lots' were purchased and as the facilities for large body pressings didn't exist, they were constructed from several small pressings to save time and expense. On the four door saloons, only the pressings for the right front door and the left rear door were used. Buehrig designed an attractive aircraft type, machine turned dashboard to house the cheaply bought instruments. Unknown to visitors to the CORD 'stand' at the Auto Shows, the cars were incomplete and were there purely for cosmetic reasons to test public reaction. The front wheel drive was still under development and the pressing that formed the front transmission 'tray' was hollow, but the design of the car was enthusiastically accepted and many orders were placed. Several buyers paid deposits based on an impossible delivery promise for Christmas, but all that they got were small scale models of the CORD mounted on a marble plinth as consolation for the delay. The cars were eventually ready by the following March but customers that had patiently waited, were less than pleased with their cars when they finally took delivery. Gear changes were painfully slow. The gear change was in the form of a small ring that moved through a tiny 'gate' on a stalk situated within finger reach below the righthand side of the steering wheel. After selecting the gear, depressing the clutch operated a series of electro-magnets and vacuum-operated servo's. But the delay was far too long to be acceptable. Besides the niggling transmission probems, several complaints were made that the car was also slipping out of gear. They boiled up due to narrow water passages, which invariably cracked the aluminium cylinder head and there were problems with vapour-lock in the fuel system due to the heat. Although the design of the car was widely praised, it's mechanical instability meant that only about one twelfth of the proposed production quantity were sold. The CORD 810 range consisted of four body styles, two sedans that were given the names 'Beverly' and 'Westchester' (the only difference was the interior trim), the 2 seater 'Sportsman' convertible and the convertible Sedan-Phaeton. The hood of the convertibles folded completely out of sight into the boot under a metal cover to give a smooth appearance to the rear end. In 1937, the 810 was replaced by the 812 with it's large diameter flexible exhaust pipes protruding boldly from each side of the bonnet. The unsold or unfinished 1936 CORD 810's were renumbered and sold as 1937 CORD 812's. The 812 was given a small 'boot' extension that many thought spoiled the original smooth or 'fastback' design. A longer wheelbase Custom Berline, with sliding glass partition was added to the range and the maximum speed was increased to around 100 mph. Unfortunately, as a result of extremely poor sales, Auburn stopped production of cars at the end of 1936. By this time, Erret Cord had begun to lose interest in automobile manufacturing and started to sell off his assets to follow alternative interests in radio, television and realestate. But he retained the Lycoming factory and made aeroplane engines during WWII. In 1937, the Duesenberg and CORD marques followed Auburn and ceased production. 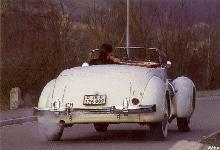 By 1938, the receiver's were called in and the Auburn-CORD-Duesenberg concern was sold to Dallas E. Winslow of Detroit. Only 2,320 CORD 810/812's were sold and the body dies were eventually purchased by Hupp (Hupmobile) who made an arrangement with Graham to use them for making similar cars called Hupmobile 'Skylark' and Graham 'Hollywood', both using conventional running gear. But the dies were too complicated to use and both companies failed with them. Their last known whereabouts were with Nissan, who decided not to scrap them, but they were never used and remained hidden away in crates. Their ultimate fate is not known although they were still in existence well into the 1960's. Erret Lobban Cord died on the 2nd of January 1968 at the age of 74. It is thought that at the time of his death his personal fortune was estimated to be in the region of 17,000,000 dollars. The CORD design was praised for it's beauty by the New York Museum of Modern Art and several enthusiasts have attempted to reintroduce the much admired car in replica form over the years. At least one replica was in limited production and was built to 4/5ths scale. Between 1964 and 1970, companies in Tulsa and Oaklahoma tried to produce replica's of the original design, but both failed. 1966 saw a replica CORD 812 with a Corvair drivetrain and copies built between 1968 and 1970 were powered by Ford and Chrysler engines. The project was acquired by Howard Williams in 1972 and he joined forces with Gene Bicknell in 1983 to start another replica attempt.